Mention the words “illegal immigrant” and most Americans conjure up images of desperate migrants sneaking across the Mexican border. There is another side to America’s immigration problem, however, that most know very little about — those who come with valid, temporary visas and do not return home. According to a 2006 Pew Hispanic Center study,1 nearly half of the 12 million-plus illegal aliens in America arrived legally with temporary, non-immigrant visas. The Department of Homeland Security (DHS) estimates that a “substantial” percentage of America’s illegal population is made up of visa overstays — their estimates range from 27 to 57 percent. The Government Accountability Office (GAO) noted in a 2004 report2 on visa overstays that DHS may be significantly underestimating the magnitude of the visa overstay problem — noting that the DHS study only quantified the number of visa overstays in the illegal population — whereas many who overstay visas are later able to legalize their status. A DHS survey of 1,000 legal permanent residents (green card holders) revealed that 30 percent had previously been illegal and that 31 percent of that group had overstayed non-immigrant visas.3 These statistics drive home the point that huge numbers of foreign nationals are succeeding in convincing American consular officers that they are bona fide tourists, when in fact they are intending immigrants. Despite the importance of visas to our immigration problem, all of the major American presidential candidates still frame the illegal immigration crisis solely in the context of securing the border with Mexico, and no candidate has mentioned the need to tighten our visa regulations. Despite that fact that the law is written broadly enough that most foreigners from the developing world could be refused for a visitor’s visa as “intending immigrants,” non-immigrant visa issuance rates are still shockingly high. In 2007, 74 percent of the more than five million foreign nationals who applied for visitor’s visas were approved. (See Table 1.) This figure is particularly startling when one considers that citizens from the world’s most prosperous countries — including most of Western Europe, Japan, Australia, and New Zealand — do not need visitor’s visas to enter the United States. Two-thirds of Mexican applicants were issued visitor’s (B1/B2) visas (or border crossing cards), four-fifths of Chinese applicants were issued visas, 88 percent of Russians were granted visas, and more than half of Haitian and Dominican applicants were successful.4 (See Table 2.) In this Backgrounder, the author, a former State Department official with experience interviewing tens of thousands of visa applicants from all over the world, explores some of the reasons why it remains relatively easy for all but the most destitute applicants to obtain non-immigrant visas, despite the public perception that visa regulations have tightened since 9/11. • Foreign service officers tend to have a diplomatic rather than a law enforcement mindset. • The crushing volume of visa applicants. Most visa processing posts are woefully understaffed, which results in very brief interviews. Managers value speed of adjudication over clarity of decision making, so many borderline visa cases that deserve closer scrutiny end up being issuances. • Developing countries place great importance on visas in bilateral discussions. • Consular managers are required only to review visa refusals — not issuances — forcing consular officers to routinely justify denials. • There is a lack of accountability and emphasis on adherence to the law as a promotion criterion. • There are no quality control measures — evidenced by the fact that the State Department never requires posts to conduct visa validation studies to estimate visa overstay rates. • Consular officers’ tend to value applicants’ purpose of travel over their legal qualifications for the visa. • DHS has failed to implement meaningful exit controls or to share entry/exit data with consular officials overseas, leaving officers without adequate information on visa renewal applicants. • The lack of feedback to consular officers on visa overstays leads many to underestimate how serious the overstay problem is. • Officers evaluate how well-off visa candidates are by the standards of their home country, rather than by U.S. standards, and often fail to understand how a school teacher in Romania might prefer to be a cab driver in Chicago, or why a nurse from Ecuador would wash dishes at a restaurant in New York. • Refused applicants, their relatives, and members of Congress place pressure on consular officials to overturn visa refusals, and sometimes manage to “wear down” consular officers. • Consular officers often assume that visa applicants won’t overstay their visas because they will be confined to doing poorly paid jobs as illegal immigrants in the United States, when, in fact, many who overstay non-immigrant visas are able to eventually legalize their status and get good jobs. • The simple reality that it is far easier to say “yes” to applicants than to shatter their dreams by telling them that they don’t qualify to come to America. Haiti — with a per capita GDP of less than $2,000, an unemployment rate of 66 percent, a life expectancy rate of 57 years,5 and a high rate of HIV/AIDS infection — is unquestionably a place that many are desperate to escape. So how is possible that in 2007 more than half of those who applied for American visitor’s visas in Port-au-Prince were approved? While the fact that 56 percent of Haitians were able to qualify for visitor’s visas might surprise you, consider that in 2006 more than two-thirds of Haitians were issued visas. Section 214(b) of the U.S. Immigration and Naturalization Act states “every alien shall be presumed to be an immigrant until he establishes to the satisfaction of the consular officer, at the time of application for admission, that he is entitled to a nonimmigrant status.” This section of the law gives consular officers wide latitude to refuse any applicant who cannot overcome the presumption that he intends to immigrate. The law places the burden of proof squarely on applicants, meaning that they are guilty of being intending immigrants until they can prove their innocence. How then, are so many Haitians able to convince consular officers that they intend to return to Haiti, despite the wide disparities in living standards between the two countries? The high issuance rates in Port-au-Prince are hardly an exception to the rule. Only one country in the world — Laos — has an issuance rate of one-third or less. More shocking is the collection of countries where a majority of visa applicants have been approved for visas in 2006 and 2007, which includes Bangladesh, the Dominican Republic, Pakistan, and Uganda (see Table 2). This is not a complete list, but rather just a sampling of developing nations where the majority of visa applicants are successful, in spite of the huge disparity between the living standards of these countries and the United States. 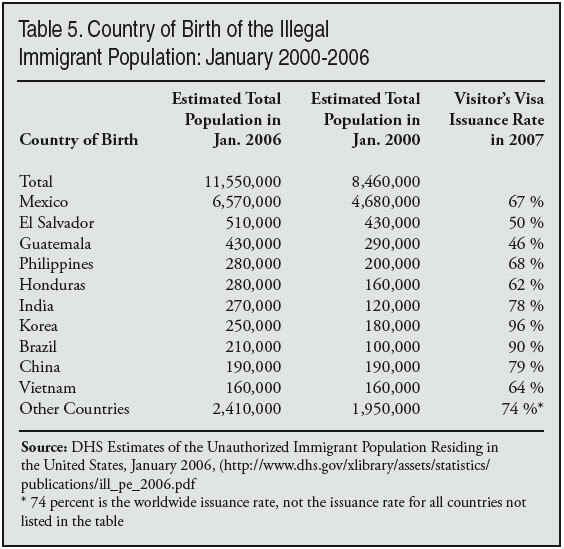 Several other countries with average per capita GNI’s of $3,000 or less with surprisingly high issuance rates for B1/B2 visas include Peru (48,238 visas issued in 2006, issuance rate of 52 percent), the Dominican Republic (77,559 visas issued in 2006, issuance rate of 67 percent), and Ecuador (more than 52,000 visas issued in 2006, issuance rate of 65 percent).10 (Complete 2007 figures are not yet available.) This is by no means a complete list of impoverished countries with high issuance rates, but rather just a sampling offered to help illustrate that it is still relatively easy to obtain visas in the developing world. One useful barometer for gauging the level of interest in immigrating to America in various countries is the green card lottery. 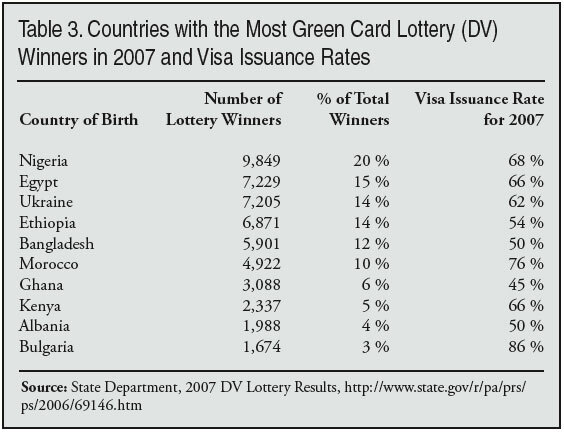 While citizens of the countries that send the most immigrants to the United States are not eligible to play the green card lottery, citizens from some 188 other nations won green cards in the lottery in 2007. Still, 80 percent of the winners came from just six countries: Nigeria, Ethiopia, Ukraine, Egypt, Morocco, and Bangladesh.11 Nigerians alone accounted for nearly 20 percent of the total worldwide winners, yet in 2007 some 68 percent of the Nigerians who applied for visitor’s visas were approved, despite the obviously huge interest Nigerians have in escaping the poverty and corruption there for the greener pastures of the United States. Each of the other five countries where interest in the green card lottery was overwhelming has a visitor’s visa issuance rate of at least 50 percent (see Table 3). It’s also worth taking a look at a few countries afflicted by poverty, political instability, and/or repressive governments. For example, 74 percent of the applicants in Belarus were issued B1/B2 visas in fiscal 2007, despite the poverty and lack of political freedom there. 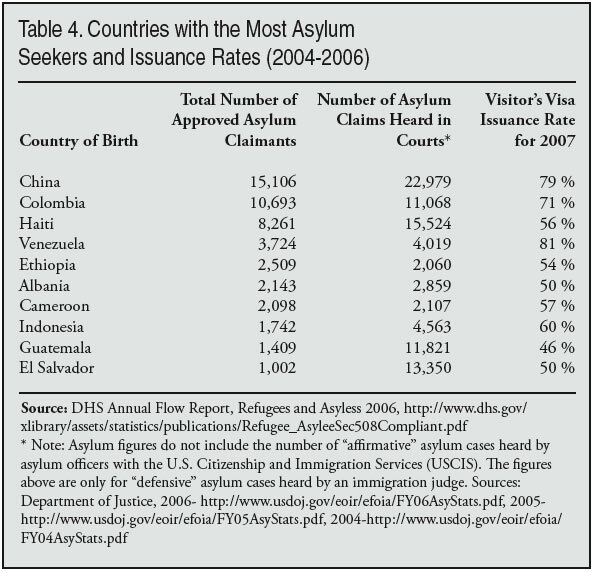 Other unstable and/or repressive countries where a substantial percentage of visa applicants still received visas include Algeria, Burma, and Cuba (see Table 2). The State Department also encourages consular officers to issue maximum validity visas to applicants in order to cut down on appointment backlogs. The result of this policy is that many applicants succeed in obtaining visas during times of peace in their countries and then use them to immigrate to the United States if the security situation in their countries deteriorates. For example, the B1/B2 issuance rate in Kenya for the last fiscal year was 66 percent and while the maximum validity a Kenyan can receive is only 12 months, multiple entry, can anyone doubt that many of the 11,040 Kenyans who received tourist visas last year will use them to immigrate to America now that the security situation in Kenya has deteriorated significantly? The citizens of several politically volatile countries — including Macedonia, the Ivory Coast, Rwanda, and Fiji — can qualify for multiple entry, 10-year visas, while citizens from Pakistan, Haiti, Lebanon, Colombia, and the Palestinian Territories can qualify for multiple entry, five-year visas. While the State Department’s desire to manage posts’ visa workload makes sense, its policy of giving long-term visas to foreigners from unstable parts of the world does not. To be fair, many of the poorest people from the least stable countries aren’t applying for American visas and the total number of visas issued to citizens from countries like Belarus, Algeria, Congo, and Burma is not huge, but the issuance rate percentages are still stunningly high given the level of desperation that exists in these countries. It’s important to note, however, that one cannot evaluate the level of desperation in a country or the degree to which citizens want to leave their countries for America based solely on economic indicators. There are poor countries where people are relatively content to stay put — however nearly all of the larger countries addressed above — the Philippines, Mexico, the Dominican Republic, Haiti, Russia, etc. — have sizeable portions of their population that are actively seeking ways to immigrate to America (as well a large diaspora already in the United States) and, unfortunately, many of them are taking that first step with tourist visas issued at consulates and embassies abroad. Consular officials often try to justify high issuance rates by claiming that the $100 application fee and the popular notion that it is difficult to get an American visa weeds out many intending immigrants who will not apply for visas in the first place. While it may be true that there is some self-selection at work in many countries, this phenomenon does not come close to justifying the extremely high issuance rates that still prevail across much of the developing world. When I served as a consular officer, I noticed that refusal and issuance tendencies tended to have a ripple effect in the prospective applicant pool. For example, I can recall numerous instances where I issued a visa to an applicant with borderline visa qualifications, and would then see numerous applicants from that person’s same village and/or social circle within the next week. Refusing applicants has the opposite effect. Meaning that most applicants take cues from their own social and professional circles — if they know people who manage to secure American visas, it encourages them to apply, and if they know people who paid their $100 fee, waited in line for hours, and then were refused, it is also a strong deterrent for them not to apply. All of this means that the high issuance rates that prevail in many posts around the world serve to encourage less-qualified people to apply, because the more people receive visas, the less intimidating the process appears to the average intending immigrant. Of course, we want to encourage legitimate travelers to visit America, and we don’t want qualified applicants to be intimidated; however, people tend to live near, work with, and associate with people of similar backgrounds. This means that when poorly qualified applicants who intend to immigrate to America receive non-immigrants visas, there is a strong likelihood that others in their social circle — who are also likely to immigrate illegally — also will be motivated to apply. There are many reasons why visa issuance rates are as high as they are, and it’s difficult to make generalizations. Every visa issuing post is different since the American staff changes so frequently. When examining the question of high visa issuance rates, it’s useful to start with the fact that visa adjudications are highly subjective. There are visa applicants on both ends of the spectrum — well and poorly qualified — who would be issued or refused no matter which American officer was conducting the interview. But there are also huge numbers of borderline applicants, whose ties to their home countries are questionable, and these applicants may or may not receive visas depending on who conducts the interview. Foreign Service officers typically spend two to three years in each post before rotating to a different assignment, but at any given time, many busy consular posts may also have several temporary duty officers (often retired Foreign Service personnel) who may be there for as little as a month to fill in for staffing gaps. Thus, the cast of characters adjudicating visas at posts is constantly changing, and with each new regime visa issuance rates can fluctuate based solely upon new personnel, rather than any changes in the socioeconomic climate of the country. For example, I worked at the American Embassy in Macedonia from 2002 until 2004, and my predecessor in Skopje, whom I’ll call George, interviewed roughly the same group of people — ethnic Albanian-speaking Macedonians, and Kosovars — that I did over a two-year period, and very little changed as far as the economic conditions on the ground in Kosovo and Macedonia over the four-year period. Yet George’s issuance rate was about 60 percent, whereas mine was about 40 percent, and this type of fluctuation is not uncommon. George was a wonderful guy, smart, talented, and a world class diplomat, but most who knew him also agreed that he had “gone native,” a common phenomenon that afflicts diplomats who grow a little too fond of their adopted countries. George knew everyone in Macedonia and Kosovo, and he had such fondness for the people that it caused him to give a lot of poorly qualified visa applicants the benefit of the doubt. During the two years that I worked in Macedonia, I interviewed scores of applicants who wanted to visit people to whom George had issued non-immigrant visas, mostly young people to whom I never would have issued visas. Of course, it’s entirely possible that I refused some applicants to whom George would have issued who had no plans to immigrate to America. There is no real way to quantify if a refusal is a bad decision, however, because many people who overstay non-immigrant visas did not plan to do so at the time of their visa interview.From my experience, I would estimate that anywhere from a third to a half of those who overstay visas didn’t plan to do so before leaving their home countries. Many foreigners decide to stay after arriving, either because they fall in love with America, or an American, or because they realize that the opportunities available to them in the United States are far better than what they have at home. Others decide to stay simply because they realize they can — some falsely assume that its hard to live illegally in the United States, but once they realize how easy it is to get a job, enroll their children in public schools, find an apartment, and blend into American life without legal status, many change their minds about returning home. Many who arrive as “tourists” also are stunned to learn how easy it is remain in the United States legally via marriage to an American citizen, finding an American company to sponsor a work visa, or by claiming asylum. Even if the asylum claim or employment-based petition is denied, the process takes so long and affords the immigrant so many opportunities to delay and appeal the proceedings that one can easily live in America for years with legal status. Since many of those who will overstay their visas don’t know it themselves at the time of the visa interview, a visa refusal is hard to quantify as definitively “wrong.” However visa issuances can, and often do turn out to be quantifiably bad decisions. Changes in management also can have a dramatic effect on visa issuance rates. Section chiefs set the tone for how tough or permissive officers will be and, since the section chief writes each visa adjudicator’s evaluation, few officers want to run afoul of what their boss wants. In my career, I witnessed instances where a new manager arriving at a post had the effect of substantially changing the post’s visa issuance rate. In each case, liberal new consuls had the effect of increasing the visa issuance rate at their new posts. It can also work the other way — with tougher personnel coming in to make things harder on applicants — but I never personally witnessed that. No matter how much some diplomats may deny it, each person takes his own personal viewpoints and biases to the interview window. I would say that roughly two-thirds of the hundreds of people I worked with in the Foreign Service would identify themselves as leaning democratic or liberal. Although I have known liberal diplomats who were tough on visa applicants, I think that, in general, liberal-minded people do tend to give visa applicants the benefit of the doubt more often than not. There are undoubtedly anti-immigration conservatives in the Foreign Service who take their prejudice out on visa applicants as well, but I have to admit that I never encountered one in my five-plus years of experience. Some might conclude that I’m one of those — a staunch, anti-immigration conservative biased against visa applicants, however this is not the case. Indeed, refusing applicants can even be dangerous. I’ve had refused applicants lob threats at me and, especially when you live and work in a smaller city where the applicant lives as well, it can be intimidating. When I worked at the embassy in Macedonia, I actually bumped into visa applicants whom I had refused on the street on three occasions. Luckily for me, none of them tried to knock my teeth out, but each time it happened it served as a reminder that you can never completely escape the people whose fate you determine. On one occasion in Hungary, my wife and I were at the vet in Budapest with our sick dog, and I had the impression that the vet’s assistant was looking at me strangely. Finally she asked, “you don’t remember me, do you?” It turned out that I had just refused her visa application a few weeks before. She handled the situation with aplomb, but again, refusing applicants is a real occupational hazard for consular officers living overseas. Being refused for a visa is a very emotional experience for many visa applicants. Most of them get dressed up for their visa interviews, they pay a $100 non-refundable fee, fill out an extensive application, submit to being fingerprinted, and then they are asked all kinds of personal questions about their economic situation, family life, and purpose of travel to the United States. Their life is essentially on trial in the interview, and when they are refused, they sometimes want to lash out. Some officers hate having to refuse people to their faces, so I would argue that all visa applicants should be informed of the decision on their application by mail. It would make the entire process less emotional and confrontational, and would remove an area of stress for officers on the visa line. The bottom line is that Foreign Service Officers (FSOs) are diplomats first and law enforcement officers a very distant second. Every FSO is required to serve at least one year on the visa line in order to be eligible for tenure, so visa work is often seen as a right of passage for junior-level diplomats. Many junior officers view visa work with disdain, and are basically just trying to “get it over with.” The net result is that these officers aren’t in consular work for the long haul and are unlikely to want to rock the boat by deviating from the culture of visa issuance that still exists in the State Department. The 9/11 commission noted this culture of issuance, commenting that “the State Department’s policy guidance to visa officers prior to September 11 concentrated on facilitating travel.”15 Although State now requires all visa applicants to appear for a personal interview, and has introduced technological innovations, such as biometric fingerprint scans and facial recognition software to try to prevent terrorists from obtaining visas, the wider culture of visa issuance and facilitating travel still exists. Indeed, not only is there no focus on rigorous enforcement of our immigration laws as a prerequisite to career advancement, the leadership of the Bureau of Consular Affairs places virtually no emphasis on strict adherence to our immigration laws. In the summer of 2006, I took the Advanced Consular Course at the Foreign Service Institute, which is a three-week course designed to groom mid-level officers for managerial responsibility at busy consular posts around the world. We listened to presentations from every high-ranking official in the Bureau, including Maura Harty, the Assistant Secretary of State for Consular Affairs, and not one speaker addressed the importance of adjudicating visas accurately to stop intending immigrants from abusing non-immigrant visas. In fact, there was no acknowledgement or indication that visa overstays might be a problem, or that the bureau kept track of, or even cared about posts’ visa issuance rates. Visa adjudicators are evaluated on how many applicants they interview and how courteous they are to applicants, not on the quality or correctness of the decisions they make. Consular managers are constantly worried about keeping up with the huge demand for visas and in managing the massive crowds of applicants, so many of them come to value consular officers who move the most applicants in and out as quickly as possible. The busiest posts have the least time to screen applicants, so fast adjudications are essential to managing the crowds. The problem is that it is much faster to issue visas than to refuse them. Applicants don’t mind a 30-second interview if they are approved, but if they are refused after such a cursory interview many are outraged and cause a fuss at the visa window. The net result is that the crushing number of applicants causes managers to value speed over sound decisions. The 9/11 commission reported on this problem — citing a State Department “best practices” cable, which noted that there was a “basic conflict” between the efficient processing of visa applications and high quality decision making. The cable went on to state that, “quality (visa) decisions can make the process less efficient and in the context of declining staff, posts have often been forced to chose efficiency over quality (decision making).” 16 Yet six years later, little has been done to address this conflict, as posts are still overworked and understaffed, with the result being continued emphasis on speed of adjudication rather than quality decision-making. I have never heard of a consular officer winning an award or meriting a positive evaluation or promotion based on being a tough adjudicator, though speed of adjudication is a quality that is frequently praised and valued. Very occasionally, posts will conduct limited validation studies to learn more about their overstay rates, but the truth is that posts rarely conduct comprehensive validation studies because A) they are time-consuming to conduct and take manpower away from visa processing, B) managers are afraid that the results will reflect poorly on them, C) the State Department does not require posts to conduct them, and D) there are no rewards or punishments for good or bad visa adjudication, as the State Department culture simply places no emphasis on making quality visa decisions as a means for promotion or advancement. While I worked at the embassy in Skopje, we conducted just one comprehensive validation study and it only looked at college students applying for J1 Summer Work and Travel visas. The results were not encouraging — even though we refused half the applicant pool, one-third of the college students who received visas abandoned their studies at home to live in the United States. In Trinidad, I asked the local employees at the embassy when the last validation study was conducted and no one could remember a validation study ever being conducted there. Many determined applicants who are refused for visas embark on crusades to have the decision overturned, and sometimes they are successful. Embassies and consulates receive so many letters and phone calls from refused applicants and their friends and relatives that many posts have staff dedicated solely to responding to these complaints. The friends and relatives of refused visa applicants also frequently contact their congressmen or senators to write letters on behalf of the refused applicant. Some particularly persistent applicants bombard embassies and the State Department with inquiries — they’ll get their congressmen, both of their senators, and often random other people to write letters, all of which require a written response. I was fortunate to have a section chief in Skopje who rarely reversed visa decisions based on outside pressure, but I also have seen many other managers who routinely overturn officers’ visa refusals without good reason. For example, I did temporary duty as a consular officer in Bulgaria in the summer of 2004, and refused a student visa applicant that wanted to attend a community college in Las Vegas. The young man, who had terrible grades and said he wanted to study physical education because “he heard that was the easiest major,” blatantly told me that he had no intention of ever returning to Bulgaria if he received the visa. He went on to explain that he had several Bulgarian friends who lived in Las Vegas, and that he wanted to live with them. His candor was rare, so I re-phrased the question, and once again he repeated that he had no plans to return to Bulgaria after attending the community college. I documented everything that he said and refused his application. Less than an hour later the section chief, who had an issuance rate of just over 98 percent at that time, informed me of his intention to overturn the refusal based solely on a phone call he received from the boy’s father — who worked for a well-known NGO in Sofia. After I protested what seemed to me to be a blatant abrogation of our law enforcement responsibility, the section chief sent an e-mail to my boss in Skopje complaining that I had challenged his authority, and his complaint ended up as an “area for improvement” on one of my employee evaluations. Receiving an inquiry from a member of Congress regarding a visa case doesn’t always mean that the refusal will be overturned, but it does mean that the section chief will have to justify the decision in writing with specifics of the case. Since Congress controls every aspect of the State Department’s budget, State has a vested interest in keeping Congress happy, and congressional interest does often play a role in overturning visa refusals. Take for example the case of a Hungarian family I encountered in Budapest. A young man whom I’ll call Laszlo and his brother-in-law Janos applied to visit their mother/in-law who was supposedly dying of breast cancer in New York. Both men were either unemployed or involved in casual, part time manual labor and one of the men overstayed previous visas and then had subsequently been refused on multiple occasions. The mother/in-law was a Hungarian living in the United States with a tourist visa and receiving free medical care for breast cancer. However, she did not let her precarious immigration status stop her from contacting her congressman, and he took an active interest in the case. After receiving letters and phone calls about the case, our section chief in Budapest, who at the time issued visas to 98 percent of the applicants he interviewed, issued the men visas despite their family history of visa abuse and weak economic situations in Hungary. After their visas were issued, one of the embassy workers mailed documents they had submitted through the congressman back to their home addresses. A few weeks later, both envelopes came back stamped, “Resident no longer lives at this address.” We called the telephone numbers listed on their applications and they were both disconnected. One of the local employees did some checking and their neighbors confirmed that the men had moved to the States and had no intention of returning to Hungary. Furthermore, the mother/in-law, who was supposed to have been on her deathbed in the fall of 2006, was still alive in May 2007, so I am uncertain whether her illness really had been life-threatening. I called the congressman’s office and spoke to one of his legislative assistants who had pushed us to issue the visas in the first place. “I am so glad you brought this to our attention,” she said, feigning surprise, “that is really disturbing, I’m going to talk to my boss and get back to you about this.” But of course, she never did, and I did not pursue it because I knew my boss wouldn’t have wanted me to. Immigration attorneys also frequently attempt to convince consular managers to overturn unfavorable visa decisions for their clients. During my first week in Trinidad in the fall of 2004, the consular section chief told me that he’d been pressured into overturning the visitor’s visa refusals of a few dozen Trinidadian women who had admitted to giving birth to American citizens and not paying for any of the medical costs while residing in the United States on tourist visas. Somehow, this group of women had teamed up and had found an American immigration attorney to take up their cause. I remember asking the consul, who was a great diplomat but a very permissive consular officer, why the women couldn’t have been refused as “public charges,” since they admitted that they hadn’t paid for their medical bills. The section chief had swallowed the immigration attorney’s specious legal argument that the women weren’t public charges — or intending immigrants — because “no one had asked them to pay at the hospital” and because they had eventually returned home to Trinidad. Each of the women eventually had her visitor’s visa renewed, despite the fact that some of the women had actually given birth in the United States without paying any of the costs on more than one occasion. Many section chiefs will also reverse visa refusals based on pressure from other colleagues at the embassy. Every American who lives in a developing country gets hit up for help obtaining an American visa at one time or another, and the pressure is particularly acute for those who actually work at the embassy. Diplomats also have the ability to write visa referrals for contacts, but in reality referrals are often granted for people who are merely friends or relatives of contacts. Obtaining a referral isn’t a guaranty of securing a visa, but very few applicants with referrals are turned down. One example from my past involves the sister-in-law of an embassy employee at one of the posts where I’ve worked. The American diplomat married a woman from El Salvador, and she happened to have a sister at home who had been refused for American visas five times within the last two years. The refused applicant came to visit her sister and new brother-in-law at post and, while there, the diplomat asked the section chief if they could make an informal referral for her to get a visa. Most embassies are like fish bowls, your colleagues are often also people that you socialize with, and everyone knows everyone. In this case, the referring diplomat’s wife, and the section chief’s wife happened to be friends. Despite the five recent refusals in her home country, the section chief went ahead and issued the Salvador woman a full validity, 10-year multiple entry visa. Because embassies have to respond to inquiries from refused applicants on a daily basis, consular officers are typically required to type written notes justifying their visa decision only when they are refusing applicants, and not when they are issuing them. The reason for this is simple: Very few managers ever ask why a visa was issued, yet officers are asked to defend refusals — usually in response to an inquiry — on an almost daily basis. Similarly, consular managers are required to review all of the applications of refused applicants, but not all of the issued applicants. It all adds up to a system where there is no accountability for visa issuances. Officers very rarely are asked to justify why a visa was issued, and no consular officer receives feedback regarding how many of his issuances turn into overstays. If consular officers received monthly or quarterly reports showing how many of their visa issuances turned into visa overstays, I think it would dramatically alter how visas are adjudicated at State, but under the current system officers just issue visas and then hope they made the right decisions while rarely ever finding out how those decisions turned out. The stunning lack of oversight and accountability that still pervades the visa culture at State is made even more shocking in light of several high profile cases of visa malfeasance. Last year at the American consulate in Toronto, a diplomat named Michael O’Keefe was charged with bribery after it was discovered that he was overturning visa refusals and giving preferential treatment to applicants who were associated with a businessman who had given O’Keefe money and gifts, and had even paid for O’Keefe to cavort with Canadian strippers. In other high profile cases over the last decade several consular officers or managers have been arrested; however, the resulting scandals have done little to change the visa culture at State. The net result of the lack of oversight on visa issuances with respect to visa issuance rates is that some officers definitely become gun-shy in refusing applicants. Some consular managers are better than others in resisting pressure to overturn visa cases, but it’s clear that there are many posts where visa refusals are frequently overturned as a result of pressure placed on the section chief by outside parties. Pressure does not always come directly from the refused applicant or their friends or relatives. For example, I once refused the visa application of a man who claimed that he wanted to receive some kind of job-related training in the United States. The young man was about 22 years old, had a very low salary, and had only been with his company for a matter of weeks. After he was refused, he told the owner of the company he worked for, who happened to know the Deputy Chief of Mission (DCM, second in command after the Ambassador, and usually the person the consular section chief reports to) at our Embassy. Within an hour of his refusal, our section chief had received a call from the DCM — who was actually a very fair-minded person that rarely intervened in visa matters — asking why the young man had not received his visa. While most DCM’s and Ambassadors are too subtle to flat-out order consular officers to issue visas, when they inquire about a case, it is usually very clear that they want the visa to be issued, and usually it will be, as it was in this case. I was fortunate to work for a remarkable Ambassador in Macedonia, Larry Butler, who stayed out of visa matters and empowered consular officers to issue and refuse visas as they saw fit, but unfortunately many Ambassadors and DCM’s cannot resist the temptation to meddle in visa matters. Aside from pressure to issue individual cases, there are also instances when visas are used as a political tool to grease bilateral relations. According to members of the local staff who currently work in the consular section in Ciudad Juarez, when John Negroponte was Ambassador to Mexico in the early 1990s he issued a memo to the consular section chief in which he stated that we needed to increase the tourist visa issuance rate for Mexicans in order to improve relations between the two countries. While most cases are not this blatant, what is clear is that while visas are very low on our agenda of bilateral issues with most countries, the visa issue is very high on many other countries list of priorities, due to the huge role immigrant remittances play in many developing world economies. In late 2005, I interviewed for a job on the Mexico desk at the State Department and was told by the Office Director that visas and immigration were “items 1, 2, and 3 on Mexico’s bilateral agenda with the United States.” In 2005, immigrants in the United States sent back more than $55 billion to Latin America and the Caribbean alone.17 In many poor countries, particularly in Latin America, remittances from immigrants in the United States account for a sizeable share of the countries’ GDP. Aside from the financial benefit that these remittances represent, foreign governments in poor countries also relish the idea of shedding their unemployed, who may be collecting social benefits at home. I won’t delve in detail into all of the pro-immigration forces that lobby Washington for looser visa restrictions, but its important to keep in mind that American business interests want to keep the tide of immigration flowing, both because it wants a steady supply of cheap labor and because the travel industry wants as many people traveling as possible. There are also groups that want tighter control of immigration, but they are not nearly as powerful or well-funded. In short, there are always interested parties that want to exert pressure for visas to be issued, but very rarely does any person or group lobby an embassy to deny a visa. Every consular officer in the field can tell stories of applicants who received visas based on their purpose of travel rather than the strength of their actual situation and qualifications under the law. There are several different types of applicants who tend to get a pass when it comes to proving the kind of strong ties to their home country that are required under the law for most types of non-immigrant visas. Each year, thousands of sick foreign nationals apply for visitor’s visas in order to get medical treatment in the United States, and many receive visas based on their unfortunate circumstances rather than a strong and stable economic situation that will compel them to return to their home countries. Although officers are supposed to ensure that applicants have the funds needed for medical care in the United States, the reality is that the cost of providing medical care to “foreign tourists” that cannot or do not pay for their care is staggering. Applicants and their relatives who are poorly qualified for visas often use an illness or death in their family in an attempt to secure American visas. Not all consular officers issue “sob story” visas, but undoubtedly many allow the particulars of a case to trump the applicants’ poor qualifications for the visa. The second major group that tends to receive very favorable treatment is young people, particularly students. It is often nearly impossible for young people that live in developing countries to demonstrate sufficiently strong ties to their home country to qualify under the law for a visitor’s or student visa. However, after the huge dip in foreign student enrollment in American colleges after 9/11, there has been a major push to “win back” foreign students, and the State Department has all but begged consular officers to refrain from refusing student visa applicants. Several specific cables to consular posts have more or less explicitly discouraged officers from refusing student visa applicants. 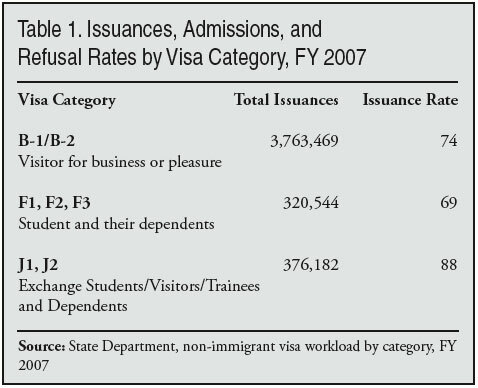 In September 2005, one such cable, entitled “Students and Immigrant Intent,” claimed that “relatively little weight” should be given to “the traditional ties” of students to their home countries, and “the fact that the student plans on studying a subject for which there is little or no employment opportunity in his country of residence is not a basis for denying the visa.” I once interviewed a Kosovar who wanted to study to become an oceanographer at a small, technical college in California, despite the fact that Kosovo is a land-locked country and has no need for oceanographers. By the logic of this directive, State is essentially telling officers not to worry about the practicality of the students future plans when assessing their likelihood of returning to their home countries. Many foreign students go so deeply in debt to obtain an American education that even if they wanted to return to their home countries after graduation, they cannot because salaries there are so low they could never pay off their student loans. Many savvy young intending immigrants from the third world who fear that they might not be able to obtain tourist visas will apply to attend open enrollment community colleges that they have no intention of actually attending as a means of gaining entry to the United States. It’s worth noting that one of the 9/11 pilots, Hani Hanjour, entered the United States on a student visa, ostensibly to study at the ESL Language Center in Oakland, Calif., but never showed up at the school after entering the United States.19 The “Students and Immigrant Intent” cable noted above directs officers to give “community colleges and lesser known schools” the same weight as four-year colleges and universities, despite the fact that many if not most community colleges do not require prospective students to speak English, take the ACT or SAT tests, or even write an essay for their application. State took this directive one step further in January 2006, as Undersecretary for Public Diplomacy and Public Affairs Karen Hughes announced the goal of doubling foreign student enrollment at community colleges. The fact is that if a prospective student has worked to gain admittance to a four-year college or university, he has already demonstrated to some degree that he is a serious student; however, gaining admission to a community college proves no such thing, because the admissions process is essentially an open door. The problem of phony students is very real, and is not confined just to poor families. For example, one of my colleagues in Skopje issued a student visa to the niece of the late President of Macedonia, Boris Trajkovski, for her to attend a community college in Ohio after heavy pressure was put on the embassy from the Macedonian government. Several months later, we found out that she never showed up at the school and was instead living with friends in New Jersey. She had concocted the student visa application because she had overstayed her previous tourist visa and didn’t think she’d qualify for another one. Luckily, my section chief and Ambassador were supportive and backed my efforts to have her deported; however the niece showed up at her deportation hearing pregnant and DHS allowed her to stay based on her medical condition. Finally, groups of applicants that travel to the United States to participate in sporting events, conferences, or cultural offerings are often granted visitor’s visas despite the fact that if they applied for visas simply to visit as tourists they would be refused for lack of strong ties to their home countries. What all of these types of applicants have in common is that they often succeed in shifting the focus of the consular interview from their weak economic situation to what they intend to do in the United States and many consular officers will issue visas to unqualified applicants if they believe that their purpose of travel — be it to gain medical treatment, to study, to attend a conference, or to participate in a sporting event — is bona fide. During my years in the Foreign Service, I had the privilege of working with some of the brightest and most interesting people I have ever known. Most Foreign Service Officers (FSOs) are well-traveled, patriotic, and honest, but some are also not very well equipped to fully gauge the level of desperation that exists in some countries around the world. FSOs live in very comfortable homes or apartments in capital cities around the world. They have free housing, utilities, and private education for their children and often have domestic help. Even in the poorest countries, diplomats tend to live quite comfortably and, contrary to what some might say, there is nothing wrong with that. However, it can lead some to underestimate how badly people from other countries want to live in America. For example, I lived in a beautiful residential area of Budapest, where the quality of life was similar to that of the United States. Like many countries, however, the capital city is not very reflective of the country as a whole. Many busy diplomats fail to develop any real understanding of what life is like in the distant provinces, where the economic situation is usually much worse than the capital, and where young people are bored and feel more of an urge to escape. The other factor one needs to understand about FSOs is that this is a group of people who have made a conscious choice to spend the bulk of their adult lives living outside of the United States. This is not to say that FSOs aren’t patriotic or don’t love America — far from it — but some FSOs either do not fit into mainstream American culture or are simply bored with the humdrum existence that many lead in the United States. All of this means that some FSOs are less likely to believe that a foreigner will abandon their lives at home to live in the United States than someone who has lived their whole life in America and would not dream of living anywhere else. Part of what is at work here is the fact that it’s impossible for diplomats to see America or the host country as the immigrant sees it. To an immigrant from the developing world, America seems like a place of endless opportunity. Yet many diplomats look at the lifestyle of most recent illegal immigrants in the United States — the hard work in blue-collar jobs, the menial wages, the lack of health insurance, and the long hours with no vacation — and think why on earth would they want to do that? It’s very hard for them to understand why a schoolteacher from Bulgaria, for example, would rather be a taxi driver in Chicago, or why a nurse from Peru would rather bus tables in a restaurant in New York, but it happens all the time. Many officers also fall into the trap of concluding that the immigrant will be confined to a lifetime of poorly paid, illegal work if he overstays his visa, when the truth is that many visa overstay immigrants do manage to eventually legalize their status and get better jobs. A DHS study of 1,000 legal permanent residents concluded that 30 percent had been illegal prior to gaining residency, and 31 percent of those were visa overstays. Many consular managers will justify issuing visas to foreigners with low salaries by claiming that they “aren’t the type to wash dishes” or do other types of manual labor in the United States. This perspective ignores the fact that many individuals who overstay visas do manage to regularize their visa status — often by marriage to American citizens or by finding employers to sponsor them — and end up securing good jobs. Additionally, diplomats frequently fall into the theory of relativity trap. Meaning that, for example, they will conclude that an office clerk making $600 per month in Belgrade won’t immigrate to America because the average Serb makes only $300 a month and the clerk’s lifestyle appears comfortable by Serbian standards. The problem with this logic is that we as diplomats don’t really understand what “comfortable” is until we’ve lived in that country as a local would, and then traveled to the States and had the chance to compare what’s on offer there. I remember interviewing a Hungarian who candidly told me that he wanted to spend the winter with his brother in Boston because, “it’s too cold in Hungary.” When I asked a local colleague what he was talking about — Boston is colder than Hungary in the winter — he explained to me how expensive it was to heat one’s apartment in Hungary. The cost of heat there is even more expensive than it is in the United States, despite the fact that wages in Hungary are dramatically lower than in the United States. In this instance, my colleague was able to give me a local reality check, but all too often consular officers are forced to guess how a local person feels and imagine how he or she will perceive America, with the frequent result of overestimating how comfortable life is for the visa applicant at home, and underestimating how great the opportunities available in America will seem to the prospective immigrant. The fact that we still have no reliable and accurate way to track visitors once they enter the United States is a scandal. The 9/11 commission decried the lack of a reliable entry/exit system, yet there is still no accurate system in place. DHS has rudimentary records of how long visitors stay in the United States, but they are not always accurate and this data is not shared with consular officers in the field. The practical result of this stunning shortcoming is that consular officers are forced to conduct visa interviews without having the benefit of an applicant’s previous entry/exit record. This means that officers have to use their intuition rather than hard facts to determine how long a person has spent in the United States on prior trips. Sometimes a “hit” in the computer will show that a person overstayed a previous visa, but often there is no “hit” in the system for those who overstay previous visas, and those people often end up getting their visas renewed. Also, there never will be a hit in the system for those that have simply spent a lot of time in the United States but did not overstay a visa. For example, many visitors try to game the system by maxing out their allotted time in the United States. Nearly all visitors arriving with visas are granted a whopping six-month stay that can be renewed, while citizens from visa waiver countries are granted a maximum of only 90 days. Some “visitors” stay for the full six months, return home for a week or two, re-enter the United States, and the clock starts all over again with another six-month authorized stay, all perfectly legal. This same person can then come in to renew his visa and, unless the officer can sense that he is lying, he can claim that he came and went to the United States only for very short trips, and his visa is renewed. If a consular officer is suspicious about an applicant’s prior travel record in the United States, he or she can send an inquiry to DHS for their entry/exit dates, but that can take weeks and sometimes DHS doesn’t respond or responds with incomplete data (e.g. no exit dates). Occasionally though, I would send for entry/exit checks and my suspicions were confirmed. When officers confront applicants who have lied in their interview and on their application about how long they stayed in the United States on previous trips, they rarely come clean. For example, I remember being suspicious about a Nigerian applicant who applied in Trinidad. The man had a previous visa and claimed to be a medical doctor, but something just did not smell right. He claimed to have never spent more than two weeks in the United States on any one trip. I sent for a DHS check and when it came back, weeks later, he came back in to the embassy for a second interview, which went something like this. Indeed, the plans of visa applicants change frequently, and those changes frequently involve overstaying visas. Only a tiny portion of those who overstay visas are ever deported; however, when a visa overstay returns home for some reason, he is, in effect, deporting himself, which is a huge cost savings for the American taxpayer. If only DHS and the State Department would integrate their computer systems, we could ensure that self-deportees cannot renew their visas. • Take away visa adjudication authority from the State Department and allow diplomats to focus on diplomacy rather than immigration law enforcement. • Create a new corps of consular officers under the Department of Homeland Security whose focus would be strictly law enforcement. These officers would operate independently from the embassy and State Department chain of command to avoid the politicization of visa adjudication. • Refocus visa adjudication away from giving applicants the “benefit of the doubt” and toward strict adherence to the law. • Require consular managers to review all visa issuances — not just visa refusals. • Allow consular officers access to entry/exit data to increase the quality of decision-making by preventing chronic visa abusers from renewing their visas. • Create accountability by providing each consular officer with data on what percentage of their visa issuances overstayed their visas. 15 National Commission on Terrorist Attacks Upon the United States, 9/11 and Terrorist Travel, A Staff Report on the National Commission on Terrorist Attacks Upon the United States, Hillsboro Press, 2004, p. 87. 18 9/11 and Terrorist Travel, pp. 11-12. 21 9/11 and Terrorist Travel, pp. 12-13.